I was trying to apply what I had learned from constructing the head in my last blog post. The four construction line are still clearly visible in the sketch (it is a sketch, so those are supposed to be still there). The resemblance with the woman on the photo is really good. Of course, the features in the face aren’t good, but the position of those features are spot on. On the other hand, I couldn’t figure out where the ears of the boy on the left were, so I couldn’t draw the four construction lines to check and control the lines in his face. So I decided not to put details in his face. Notice, that I’m using my visual knowledge of the skull to estimate how the woman’s head is laid out in three dimensions. This can only be done with “feeling the form”, in other words, comparing your internal image of the skull as a engineered shape (a block that’s 6 inches wide, 8 inches high and 7.5 inches deep). If you can’t imagine the 3D shape of the head, you’re not able to draw line number two, which runs from the base of the ear to the base of the nose, through three dimensional space. It is this line which keeps the form three dimensional in your head, instead of a flat surface. Of course, to draw the features accurately, you will need to put line number four at the correct position. Line number one divides the head in two parts, left and right, and line number three defines the outer edge of the lower face. In short, you don’t need those lines to draw a face (I could well draw faces without using those lines), but you do need those lines to form a mental picture of a head, so you can draw the features more accurately, and also draw the face from a different perspective. The latter seems important if you want to draw illustrations, like comics, because there you’re mostly working from imagination based on reality. You therefore need some method to translate figure drawing into illustrative art. The four lines method by Bridgman seems an excellent method to form a visual representation of a head in your mind, change it, and turn it into art of your own, instead of just copying what your eyes receive. I guess it is but one way to become better at your art. I’m sure there are many more to explore. 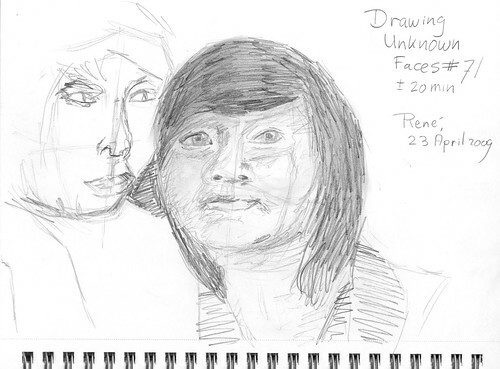 The sketch was made in circa 20 minutes with a technical pencil, and is based on a photo from t he Flickr public photo stream. 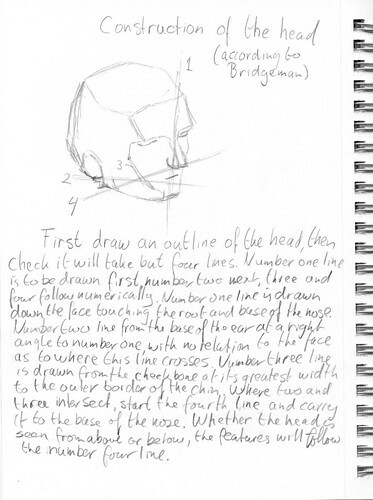 Continuing my notes about drawing the human head, as taught by Bridgman in his book “Drawing from Life”. First draw an outline of the head, then check it will take but four lines. Number one line is to be drawn first, number two next, three and four follow numerically. Number one line is drawn down the face touching the root and base of the nose. Number two line from the base of the ear at a right angle to number one, with no relation to the face as to where this line crosses. Number three line is drawn from the cheek bone at its greatest width to the outer border of the chin. Where two and three intersect, start the fourth line and carry it to the base of the nose. Whether the head is seen from above or below, the features will follow the number four line. Something else dawned on me while I was writing this text. I was able to copy the illustration in the book reasonably well. This means if I create a thumbnail of a constructed head, I should be able to use that to put it in a bigger drawing. Thumbnails are quick to draw and only a small investment of time and effort, so it’s likely not to be too hard to throw one away because it wasn’t good enough to use. If you draw much bigger, it will be probably much harder, because you have spent so much more time and effort on that sketch.